In celebration of the 800th anniversary of the Magna Carta I thought I’d share a letter from Henry III to the people of Ireland regarding the institution of the Magna Carta. It was unlikely to have been written by him, as it was still during William Marshal’s regency. The King to all archbishops, bishops, abbots, earls, barons, knights, free tenants and all our faithful subjects settled throughout Ireland, greetings. With out hearty commendation of your fidelity in the Lord, which you have ever exhibited to our lord father and to us in these our days are to exhibit our pleasure is, that in token of this your famous and notable fidelity, the liberties granted by our father and by us, of our grace and gift to the realm of England shall in our kingdom of Ireland be enjoyed by you and your heirs forever. Which liberties distinctly reduced to writing by the general council of all our liege subjects we transmit to you sealed with the seals of our Lord Gualon, legate of the apostolical see and our trusty earl William Marshal, our governor and governor of our kingdom because as yet we have no seal. And the same shall in the proceeds of time and on fuller council receive the signature of our seal. Given in Gloucester on the 6th day of February. Dr Thomas Leland, History of Ireland from the Invasion of Henry II, London, 1773, p. 203. This is obviously in translation, and was part of a significantly complicated situation but it is still interesting. 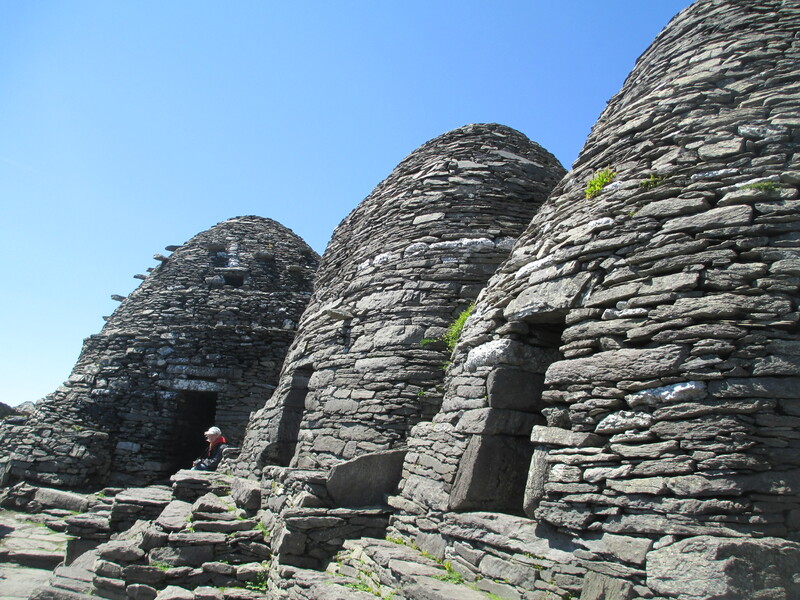 Skellig Michael is one of the most extraordinary places I have ever been. Situated roughly 13 km off the coast of Kerry in Ireland in the Atlantic Ocean. 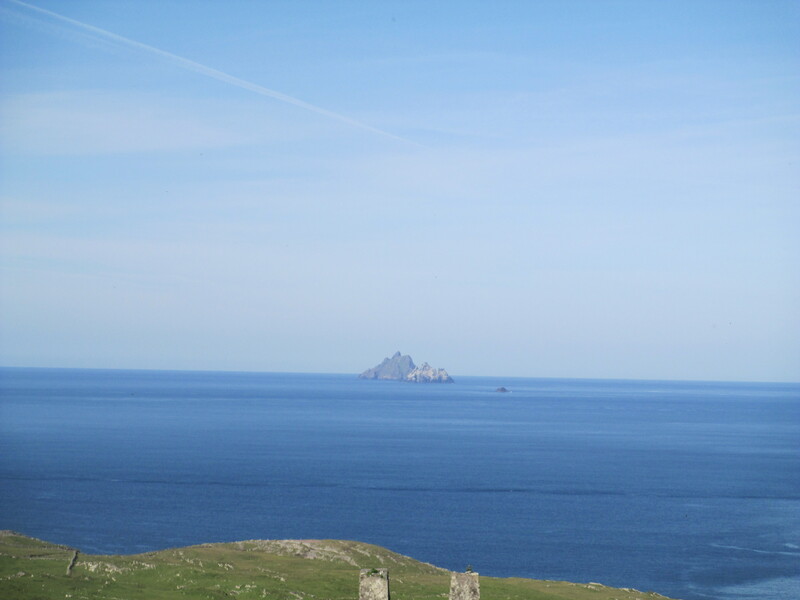 It stands with Little Skellig, which is a thriving bird habitat. Skellig Michael and Little Skellig, Skellig Michael is in the back. 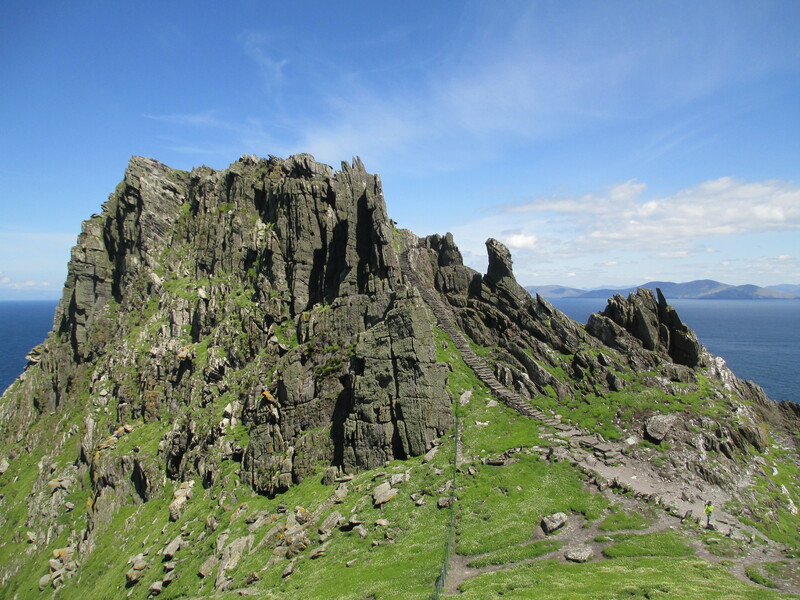 Although from the photos both Skellig Michael and Little Skellig might seem to be simply harsh lumps of rock in the middle of the ocean, this is far from the truth. 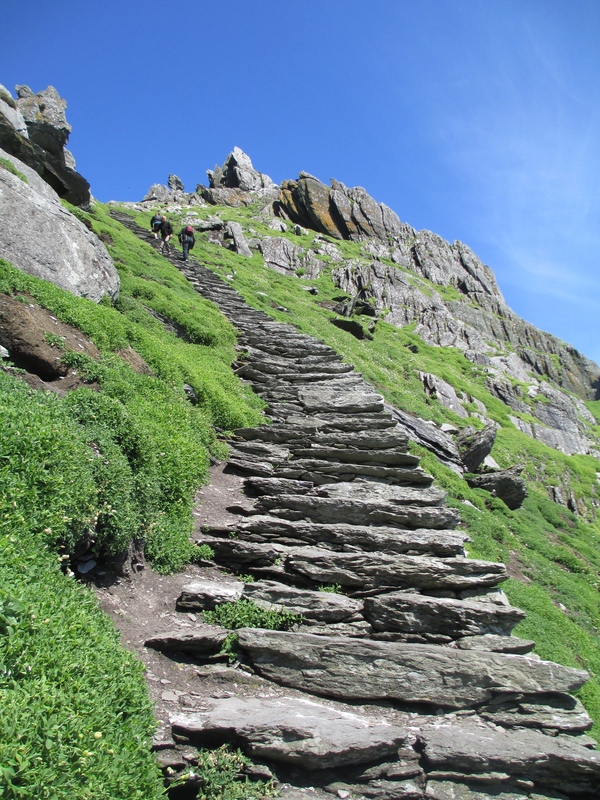 Skellig Michael has a fascinating history of habitation, and the most spectacular monastery I have ever seen is situated on its seemingly impassable slopes. 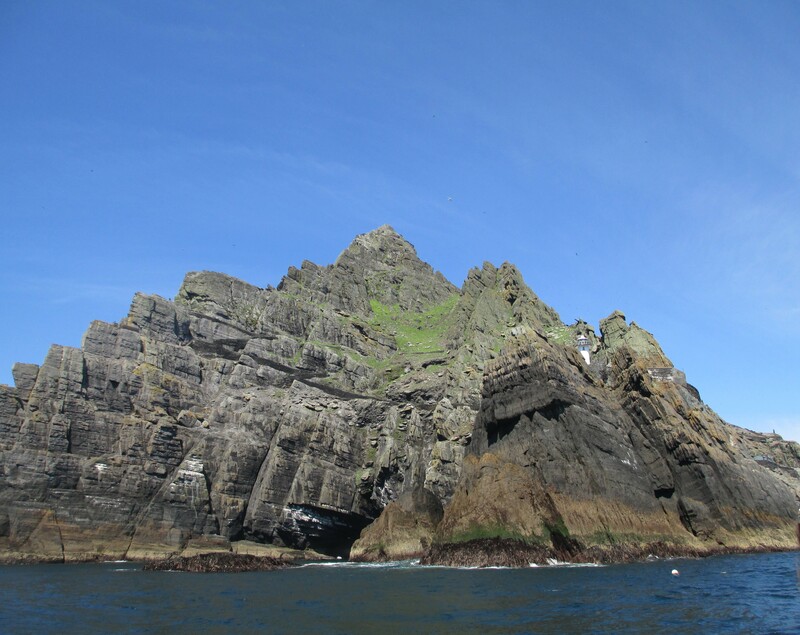 The history begins with the first known mention of Skellig in 1400 BCE when legend has it that Milesius, an early invader of Ireland, lost one of his sons, Irr, to Skellig’s cliffs. 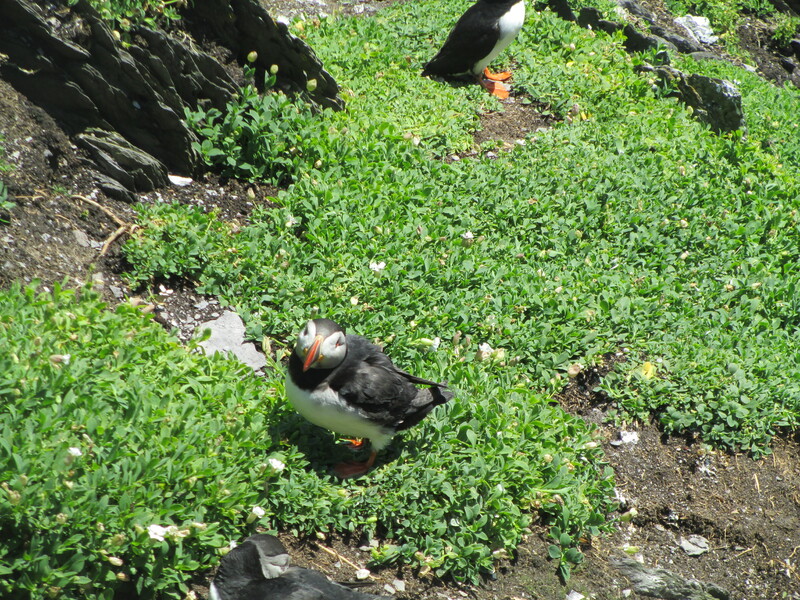 There is also legend of Skellig being a refuge for Duagh King of Munster when he fled for his life in the 5th century. 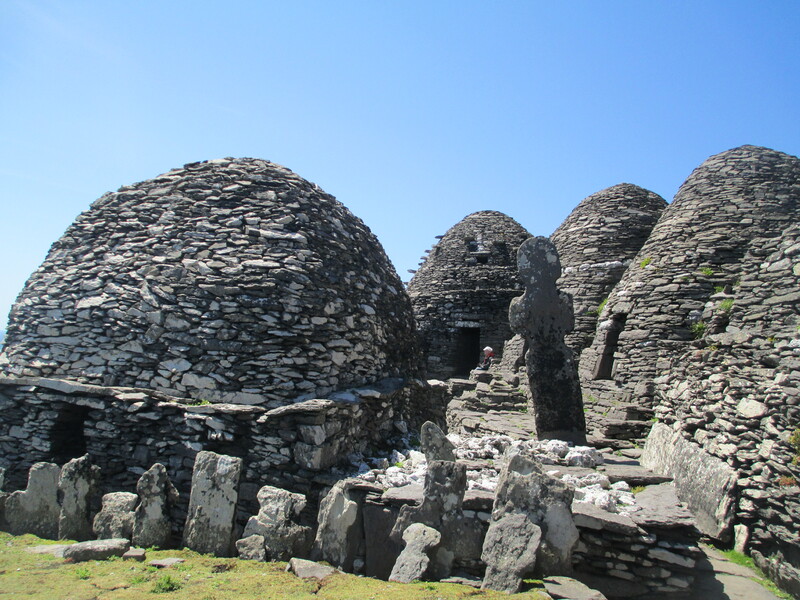 The most interesting aspect of the history of Skellig is its monastery. 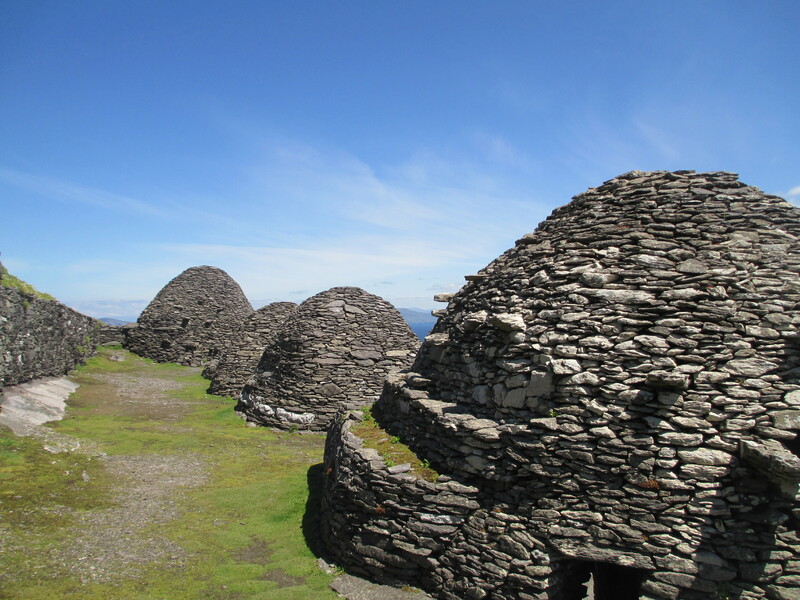 Beehive huts Skellig Michael monastery. There is debate over when the monastery was first founded, but it was part of the early Christian monks’ attempts to find sanctuary, refuge, seclusion and closeness with God in distant and remote places. 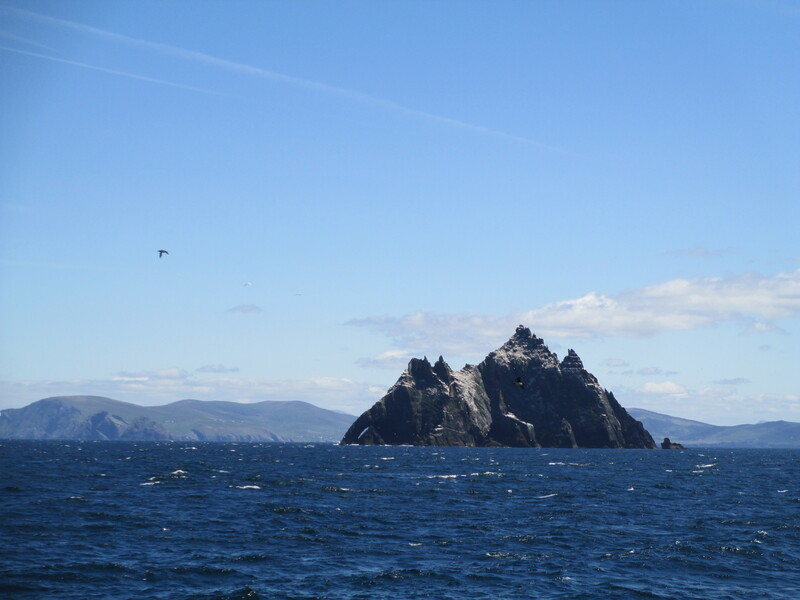 As a rock in the Atlantic, Skellig is about as remote as it gets. The monastery was probably founded in around the sixth century, no one is entirely sure and I have been unable to find any real agreement on this date. 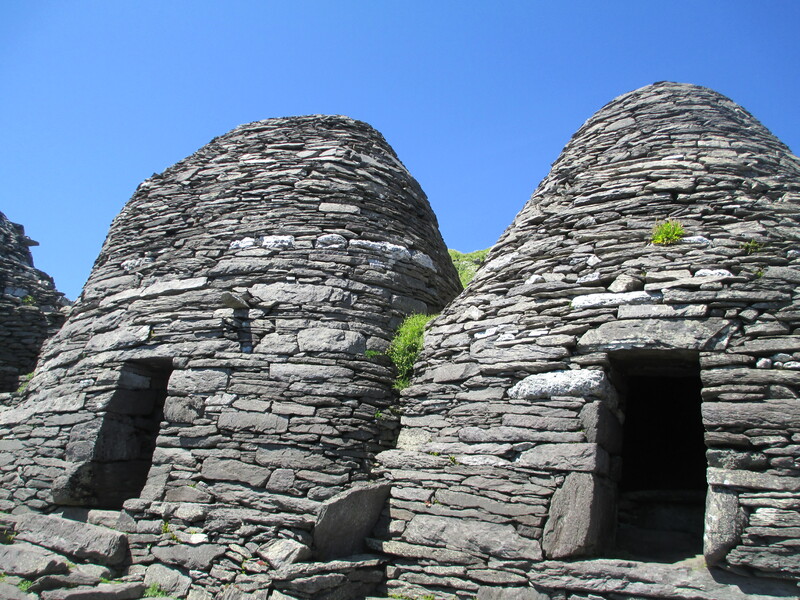 It consists of a collection of drystone beehive huts that are as weathertight today as they would have been when they were built. The integrity of the construction is truly remarkable. They would have been inhabited by a community of 12 monks and an Abbot. The conditions would have been harsh to say the least. We know they had fresh water because a rainwater collection system still exists, and works as well when it’s been cleaned out, but beyond that we don’t know much about their day to day existence. They would have lived and eaten very simply. The monastery, including the Oratory on the left and a high cross and the graveyard. The most important building for the monks was the Oratory, here prayers would have been said over a simple altar which no longer survives. If the community of 12 on Skellig Michael was not remote enough then there was also a hermitage built high on another point of the rock, it’s almost a sheer cliff so currently inaccessible. It is possible that this was also a refuge during viking attacks of which there were several. The first was in c. 795 CE. They were attacked again in 812 CE and again in 823 CE. Some records of this third attack remain beyond the fact that it occurred. It is recorded in the Annals of Ulster and the Annals of Inishfallen that this time the Vikings took Etgal, the Abbott of Skellig Michael, and they starved him to death. There were also further attacks in 833 CE and 839 CE. Somehow despite all this the Skellig community survived. It isn’t known exactly when monks ceased to live on the rock, but Gerald of Wales reported that they returned to the mainland to become part of the Augustinian priory in Ballinskelligs at the end of the 12th century, however other sources report that there was still repair work going on into the 1300s. Ballinskellings Abbey from the water. Human habitation did continue on Skellig with the construction of two lighthouses in the 1800s, one of which is still in use today. 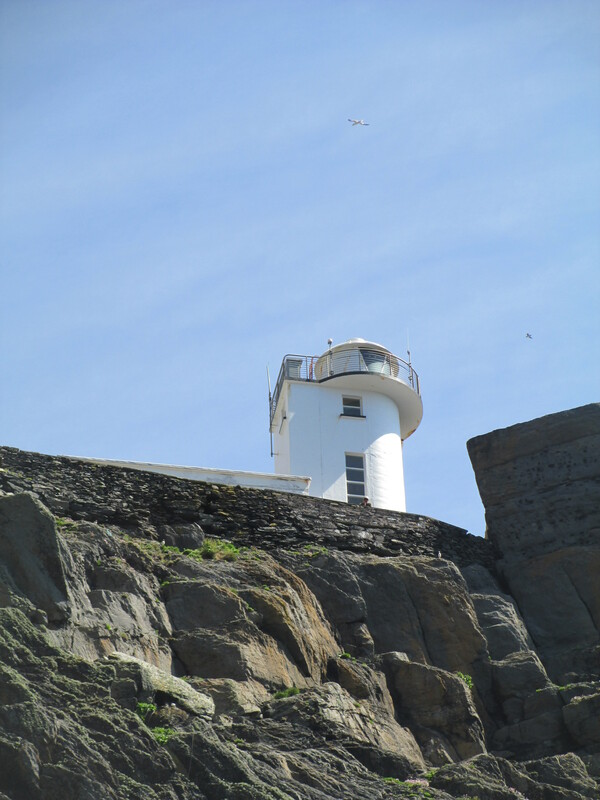 The remaining light is automated rather than having a lighthouse keeper. The monastery can still be visited today, though numbers are strictly limited. Once you arrive at the the rock the monastery is reached by awe inspiring, though very daunting, steps which would not be that different to the way the monks ascended. 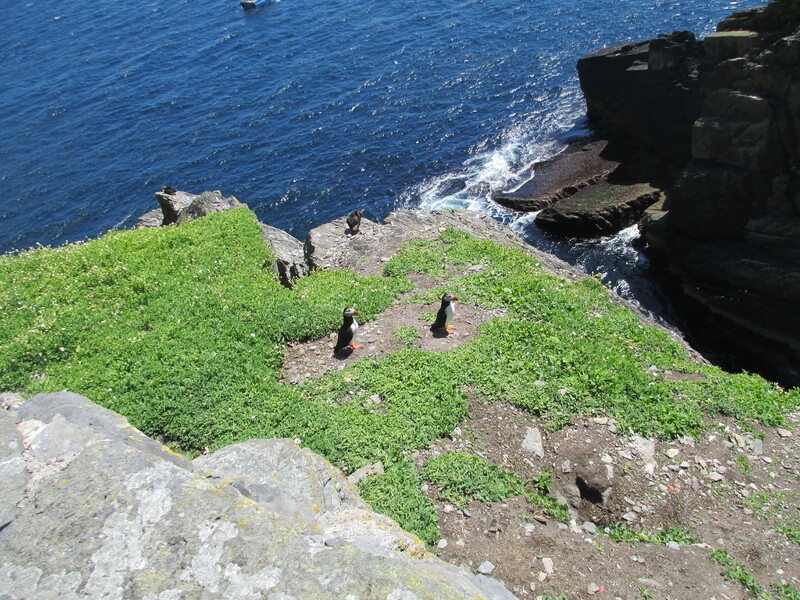 There are 640 sheer steps and it is a hard walk, but the monastery is absolutely worth it and if you are lucky the resident puffins will be out. Skellig Michael has been a site of pilgrimage for centuries, a place of penance for some, a holy place for others, a spiritual place for more and for many a rock with a truly fascinating history. I fall into this final category, but no matter your reason for going it is truly one of most remarkable places in the world. One of the more interesting medieval sites that not that much is known about. Clonmines is the remains of an abandoned town with the ruins of two churches, three tower houses and an Augustinian Priory. The town was a port that may have been connected with New Ross in the early 1200s. It was an important town. 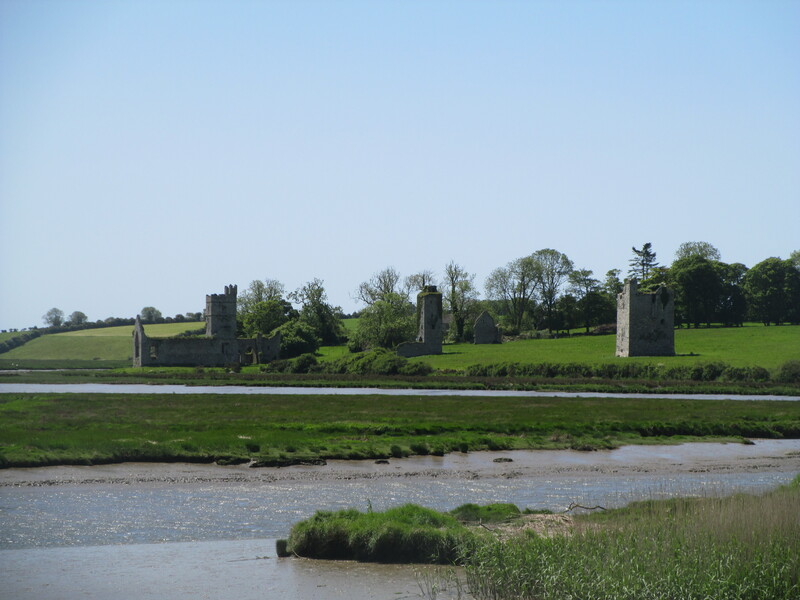 In the 1300s justice was dispensed from there and the road between Wexford and Clonmines was considered a main road. Unfortunately the town was abandoned in the 1600s when its harbour silted up, but there were Augustinians there still into the 1700s. 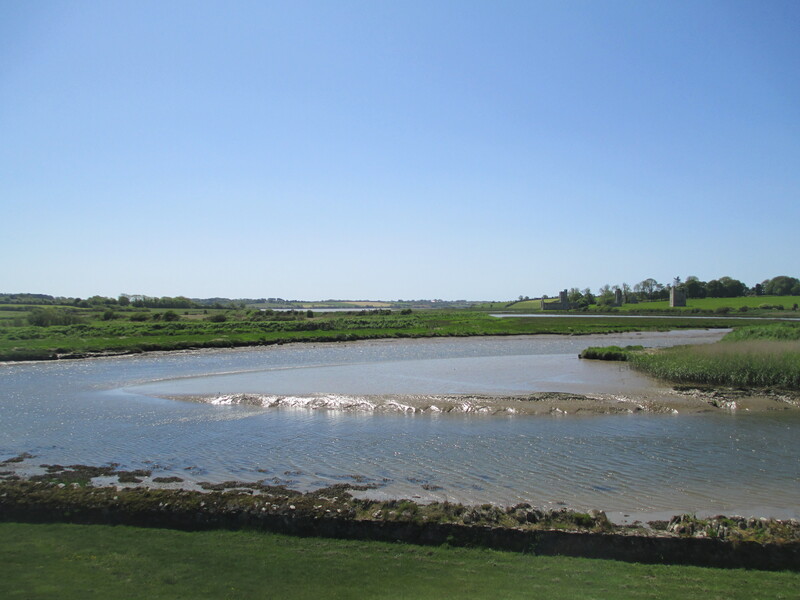 Clonmines also maintained a political presence into the 1800s with the final MPs leaving in 1801. 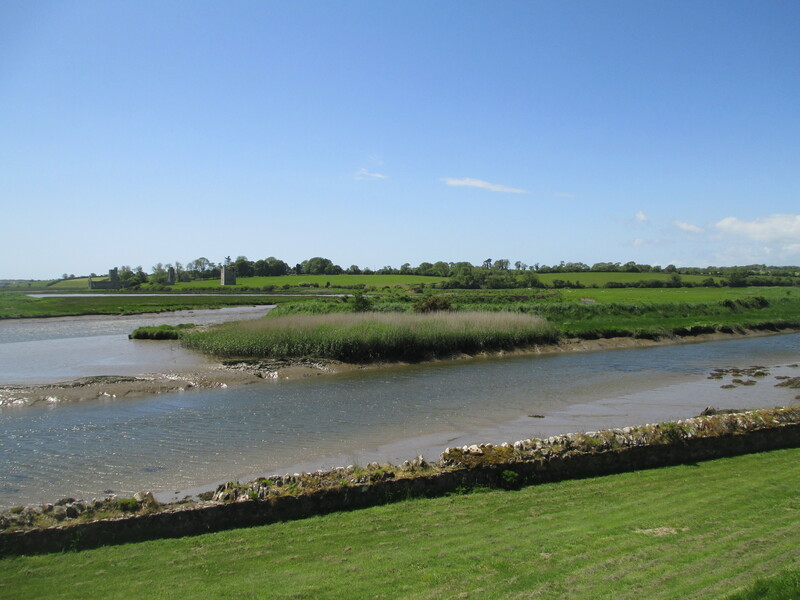 Clonmines today is on private land so access isn’t possible, but the view across the river is staggering. 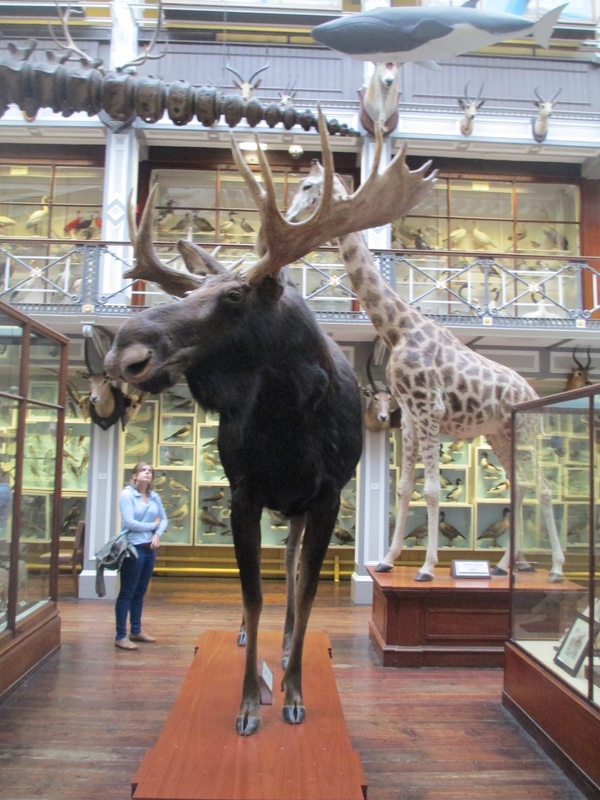 As much as what it holds Dublin Natural History Museum is history in its own right. 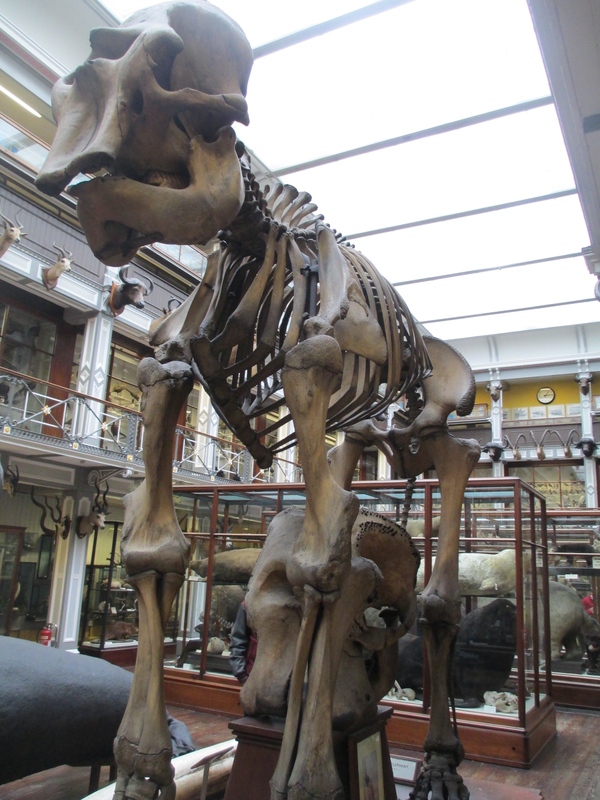 Opened in 1857 , built by the Royal Dublin Society, it really hasn’t changed much. 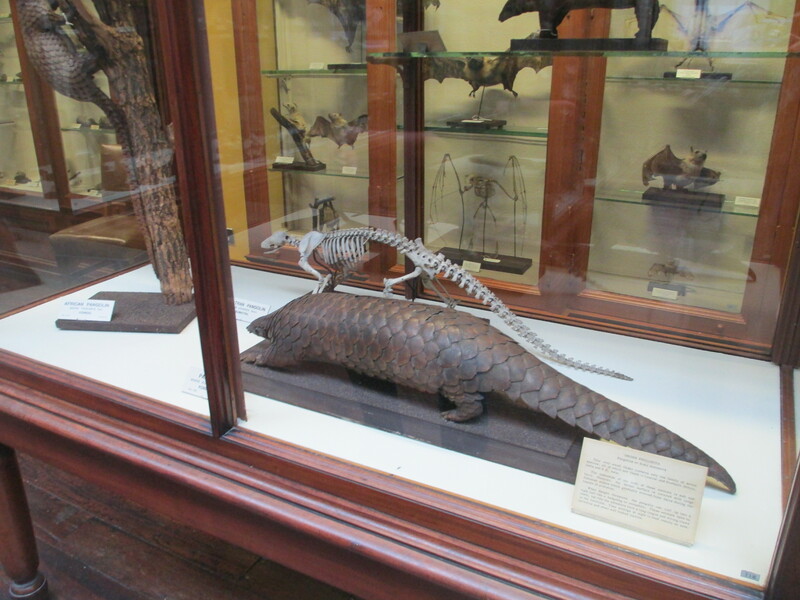 It is a museum of museums. 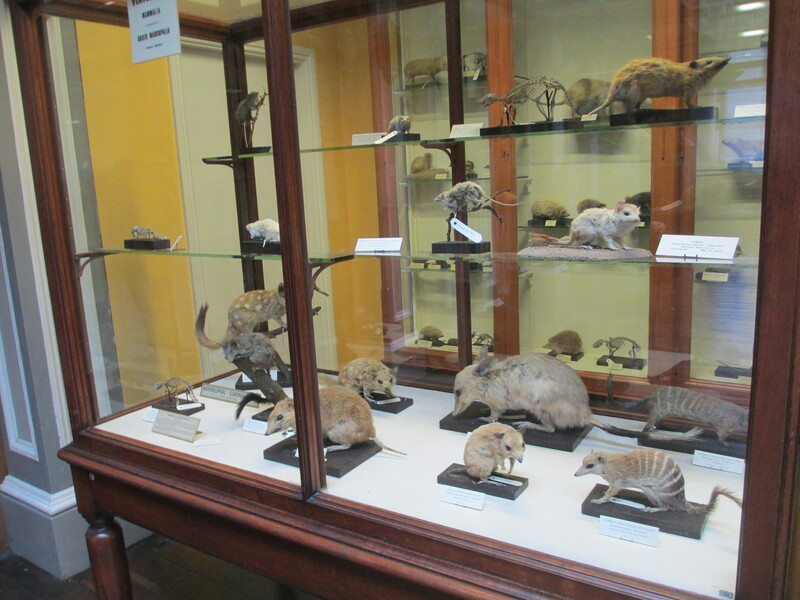 The bottom floor holds Irish animals, including some extinct ones. 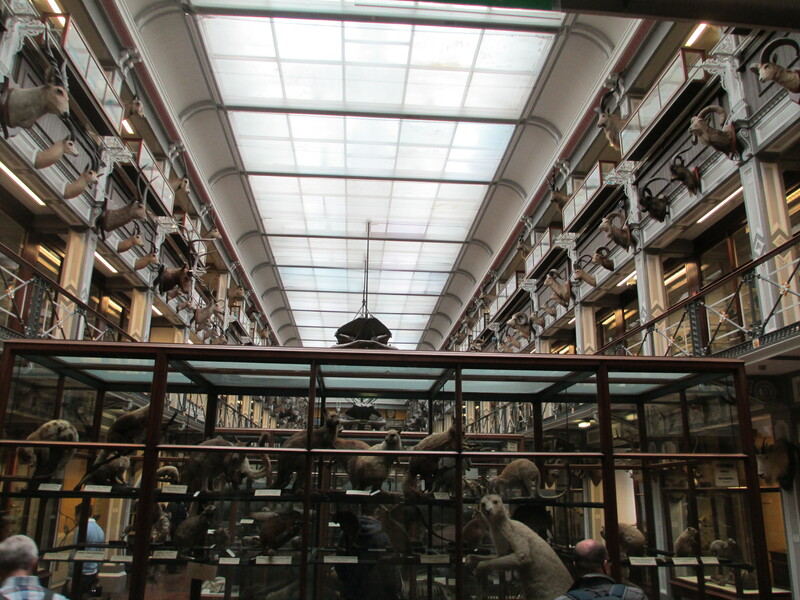 The top floor was laid out in the 19th century in taxonomic groups and it really hasn’t changed. 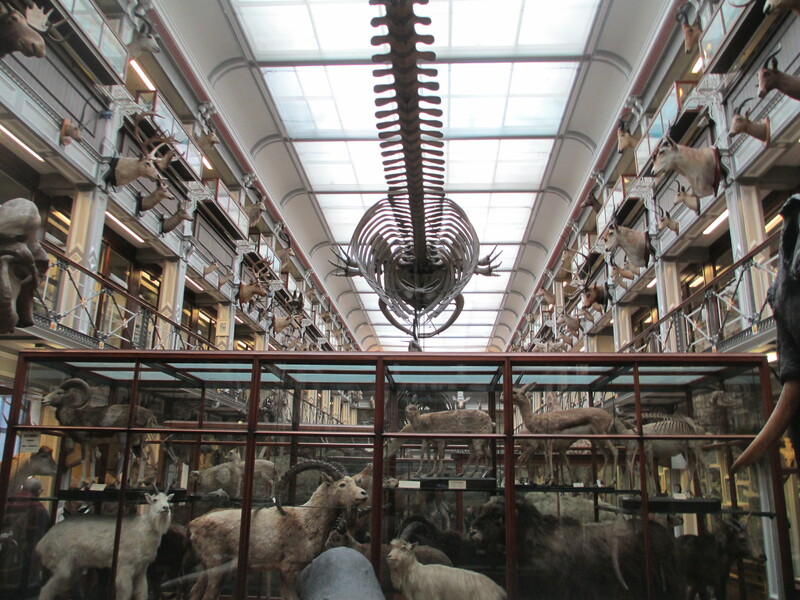 The skeleton in the centre is a whale. 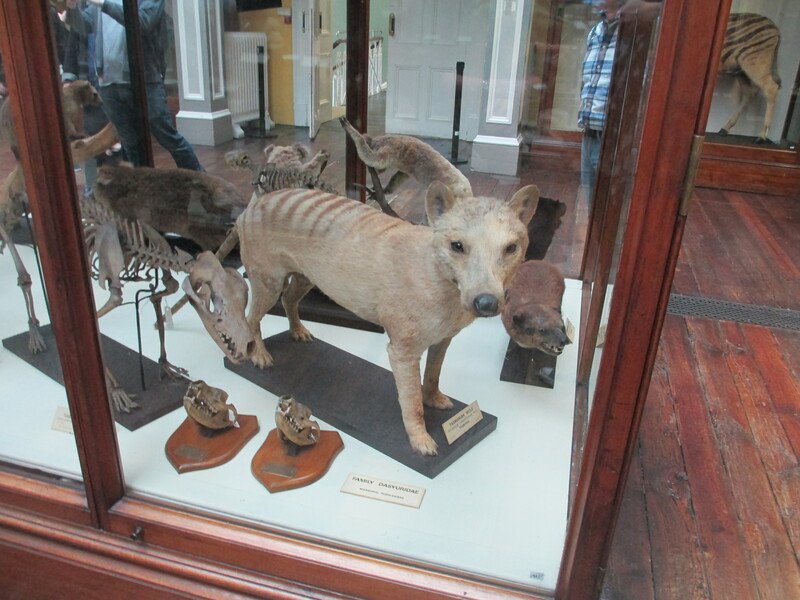 Thylacine, better known as a Tasmanian Tiger. 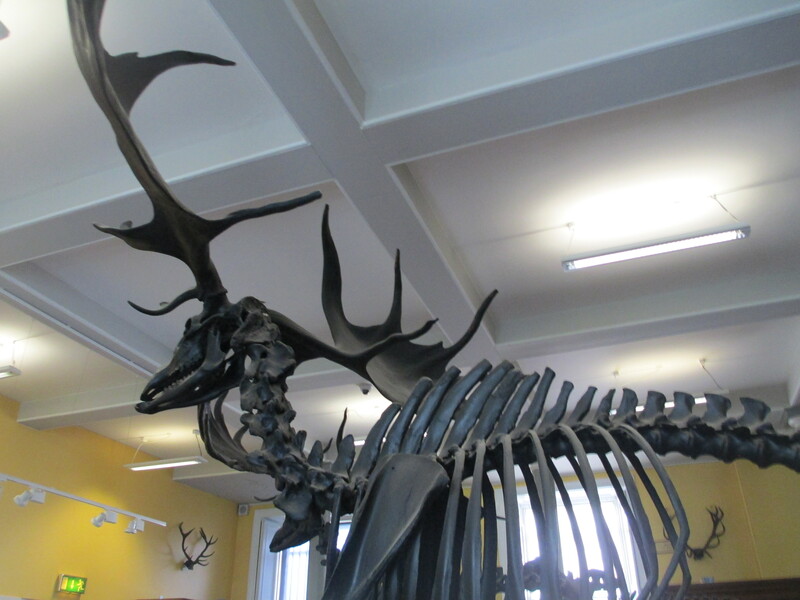 They’ve been extinct since the 1930s, though lots of people keep looking for them in the remote Tasmanian wilderness. It also has animals that I’ve never seen and am unlikely to. 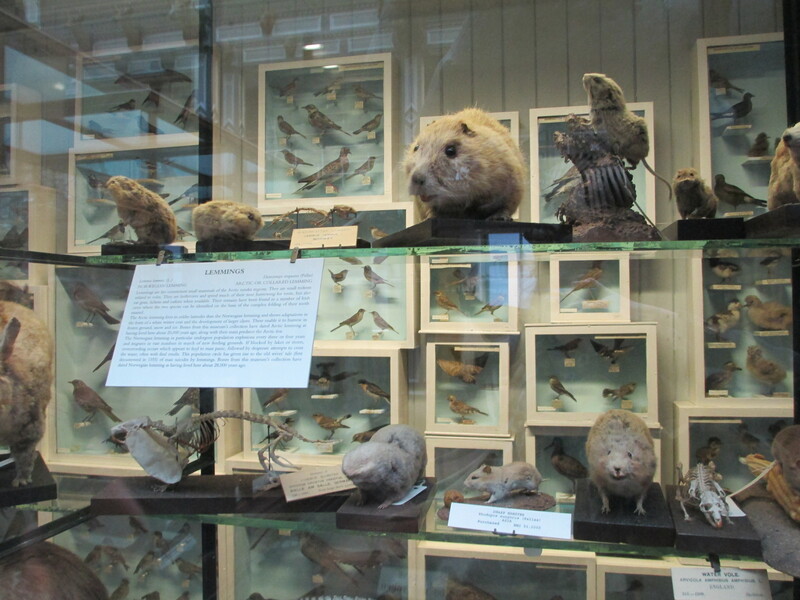 Lemmings and other similar rodents. It is enthralling to walk around. 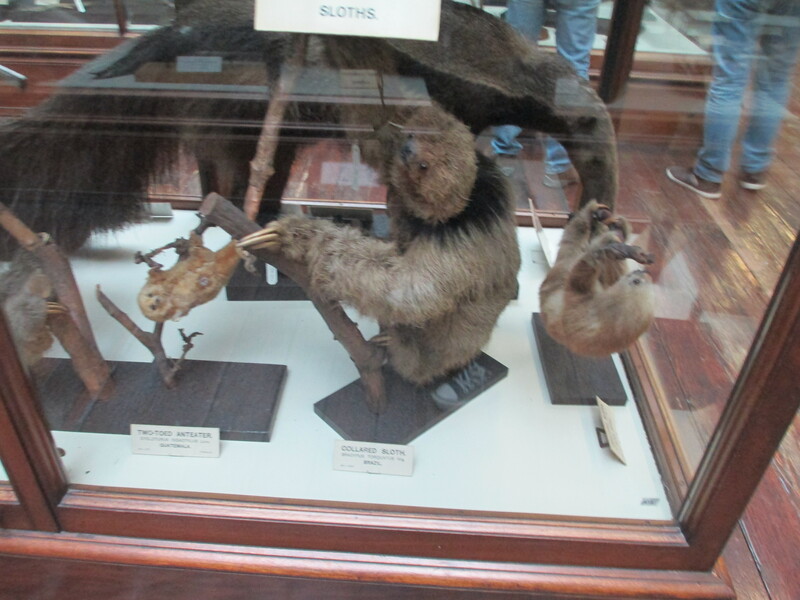 I’m too young to remember museums when they were like this and, while I can see some people having ethical issues with the sheer number of dead animals, the layout and the specimens are absolutely fascinating. 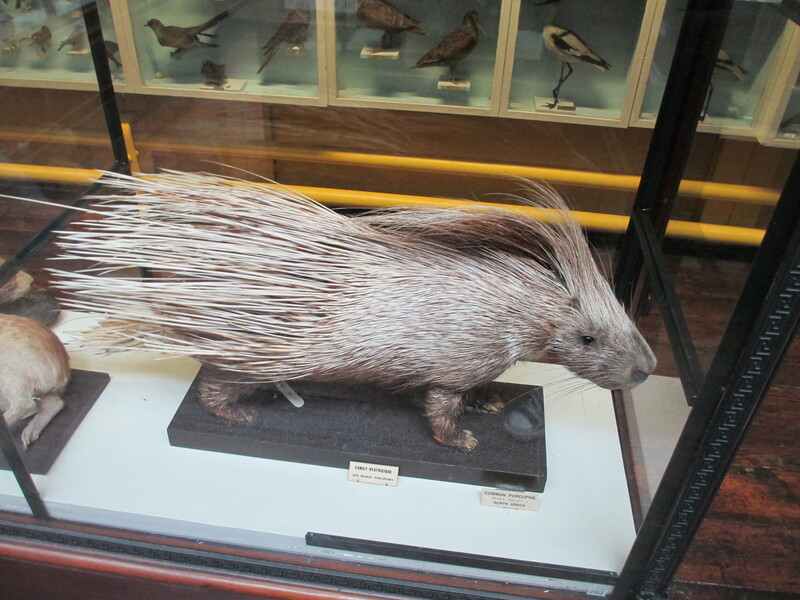 Even more than the individual specimens it is the harking back to the old era of museums that I found really interesting.